UPDATE: Live now! Click here to sign up. 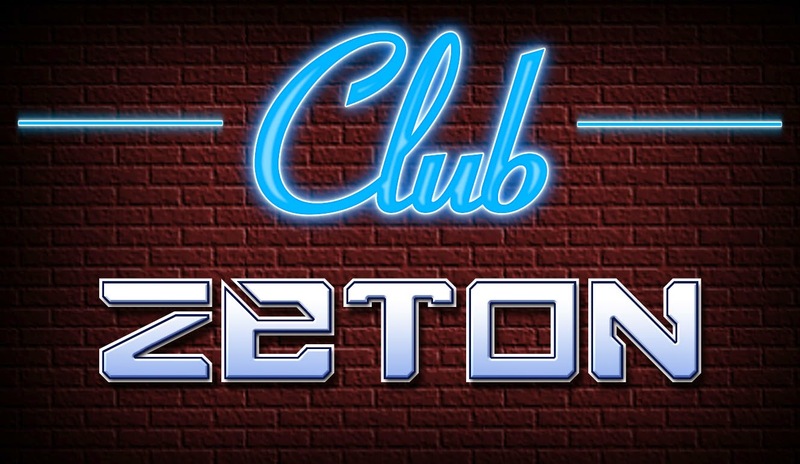 If you love Robo Force, you need to go read up on Club Zeton. This is the new Robo Force Fan Club from Toyfinity. It comes with a ton of stuff which for $75 seems to be about right. Test shots of new figures tend to go for a lot more, so go give it a look! Knights of the Slice - Toy Pizza Glyos Action Figures? Toy Pizza is an online show hosted by some of the biggest toy fans including your pal and mine Jesse DeStasio, formerly of all kinds of good things. They have a great Tumblr and apparently that isn't enough - because they're doing a toy line on Kickstarter! 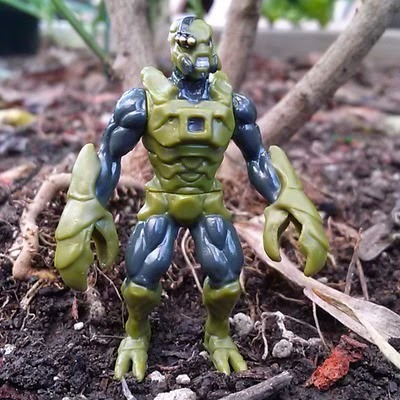 Multiple figures are being planned with plenty of stretch goals, but a note came up that may interest you guys - they may be be Glyos compatible. 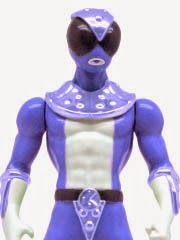 $20 is the lowest pledge to get the figure (left) and other colors of this pizza Power Rangers-y line can be had, as can accessory packs and other goodies. The Glyos part doesn't seem finalized by the posts I'm reading, but if nothing else these are neat figures from nice guys that you'll probably want to see anyway. Because really, how many pizza-based action heroes do you own anyway? 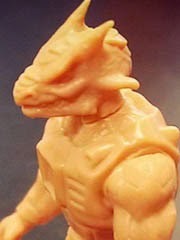 The Maxx Zero Basic Edition is the Robo Force figure I had pictured when I first heard that this license got picked up. 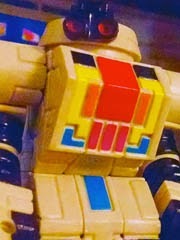 Now that the figure has decorated eyes an a colorful chest panel, he really comes to life - but he also has black tube arms, painted tire treads, and a few blue highlights. It's not as much paint as the Ultimate Edition at twice the price, but that's OK - I wanted to not spend twice the price and I'm happy with this tubby little guy. The 3-inch action figure is solid, heavy, and ultimately satisfying in a way that may hurt sales of future products - it's hard to imagine a better take on this mold. I'm sure they'll manage, but it's so impressive that I totally dig it. A new Baminon drop is coming! 1/31, 9:00 PM Eastern. 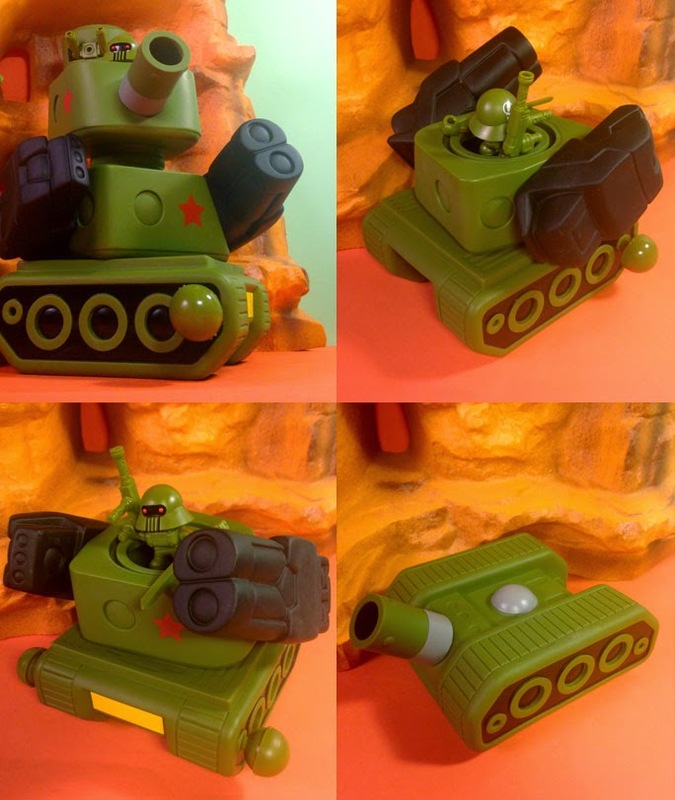 A new green Red Army Man figure will be joined by the vinyl T-011 tank - the latter of which is only just now getting its second release. Meet the New Armorvors - Neo Granthans! The first drop of the year is here, and surprisingly the new molded guys didn't sell out immediately. As of my typing this roughly 2 hours after the release, 15 of the 19 Metran Security Command items are still available including all 3 new Armorvors. Click here to see the January 25 2015 Onell Design drop menu. 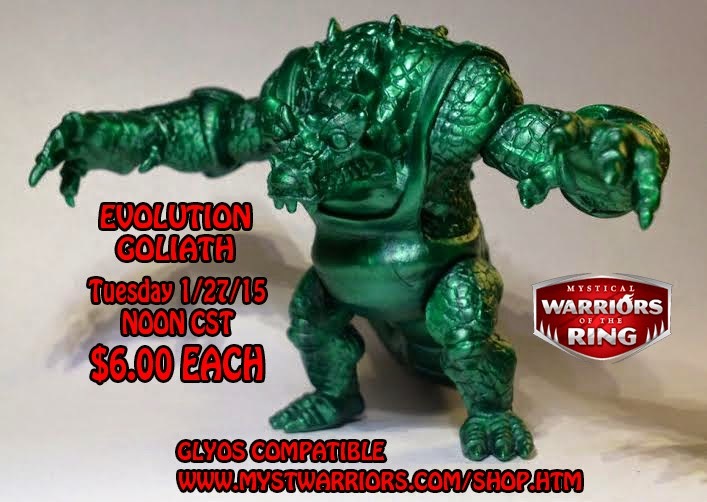 I just got a press release stating that Evolution Goliath goes on sale 1/27 for $6.00! Cheep. 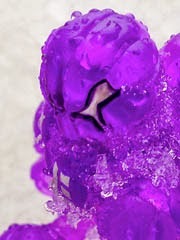 The metallic green figure can be dismantled and was designed to work best with Armorvor and Kabuto Mushi action figures. Be ready at 12:00 noon Central time. Click here to see the (mostly) complete menu from Onell Design's Sunday release. 3 items are xxxed out so those, I assume, are the new Armorvors but we don't know for sure yet. The new Sarvos is particularly nice, so be sure to check this out! 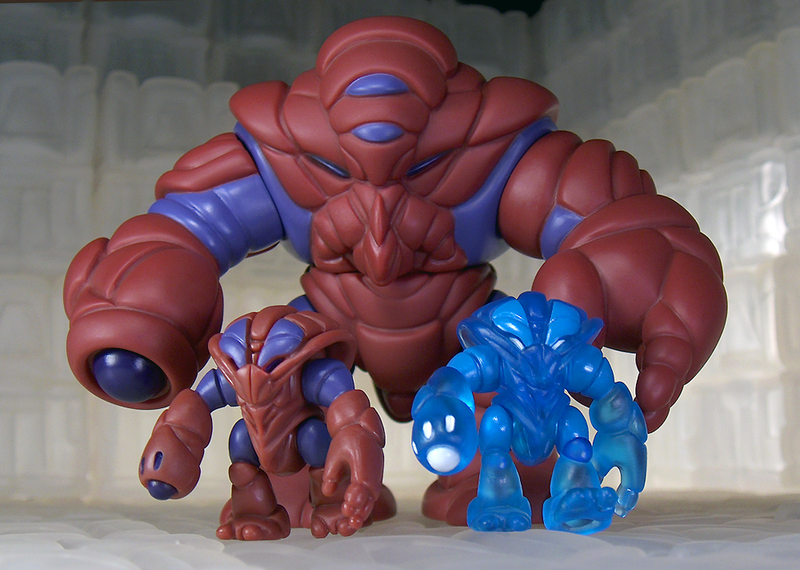 New Glyos Next Sunday - Redlaw Purple, Armorvor Too? In the post "Redlaw Effect," Onell Design confirms a new release of figures scheduled for Sunday January 25 at 9:30 PM Eastern. Other than the Redlaw Argen (pictured) nothing has been explicitly confirmed yet, but it looks like the Armorvor might be back - and if you'll recall, we were promised a new head for the next release. Here's hoping! The Crayboth Cultivator is one of a ton of new and seemingly exclusive to Crayboth figure colors put out by Onell Design last year. Normally we'd get one or two per wave, but we ended up with batches of the things with a surprisingly large amount of the little crab aliens. According to this post: MAXX-AH-AH! The figures are now in the USA and shipping soon! I haven't gotten an email asking to verify my address yet, but they're promised soon - so keep your eyes open. You'll want to check this one out. THEGODBEAST Glyos Universe & Kabuto Mushi Building Challenge update!!! is a contest where, apparently, you can win all of the above stuff. I'd love to buy some of those myself, and since I have no skills I'll have to leave it to you to win everything here - it's an impressive lot, so click here and see if you have what it takes to get toys and not pay for them.